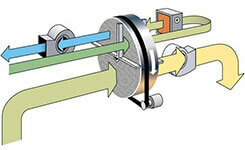 The RECUSORB principle, compared to CONSORB, works with an additional internal heat recovery. The incoming regeneration air uses the residual regeneration heat of the rotor while preheated and reducing the water content. Therefore the regeneration heater consumes less energy, and the rotor is better regenerated corresponding to the lower regeneration air humidity. The principle RECUSORB-DR is similar, but equipped with only one fan. 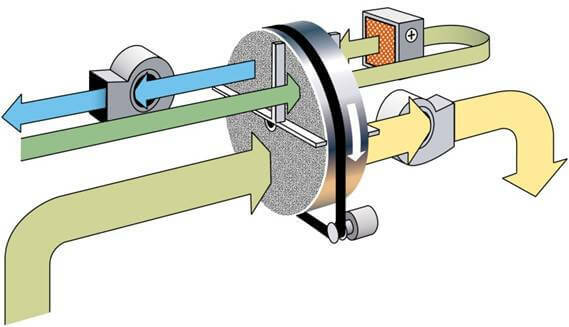 The air stream is divided before the rotor inlet into two air flows (process and regeneration air).